The Brazilian urea market is seasonally quiet at the moment, but come summer it is set for a major shake up as the country’s only producer, state-owned Petrobras, is set to permanently shut two of its three operational urea plants. The shutdowns are set to create a near 1 m. tonnes/year black hole in available production capacity with exporters expected to increase their market shares to make up for the shortfall. The plants due to close have been running at a loss for many years and in addition to the shutdowns, a fourth site currently being built will not go ahead with Petrobras looking to divest all three assets. The moves follow a turbulent few years in Brazil where the company was caught up in a myriad of corruption scandals. After the shutdowns, the two sites, the Fafen/Laranjeiras, Sergipe and the Camacari, Bahia sites, will take out a combined 0.9 m. tonnes/year of urea capacity. Based on recent production levels, the two plants had been running at 85% capacity on average. The Petrobras closures will leave Brazil with just the ammonia/urea complex at Araucaria in the southern state of Parana. The complex houses 640,000t/y of urea capacity that began production in the early 1980s. The shortfall in domestic production is set to be replaced by imports from other regions. The Brazilian domestic market is already reliant on imports for over 80% of the 6-6.5 m. tonnes of urea it consumes each year. In 2017, Brazil imported a touch under 5.5 m. tonnes with Qatar supplying just over 30% of material. Russia was the next largest exporter while other Middle Eastern countries followed, each supplying around 200,000-300,000t/year. Last year, Nigerian exports to Brazil surged by more than six times year on year as the African producer became the fourth largest supplier to the country following the start up of the new Indorama complex. 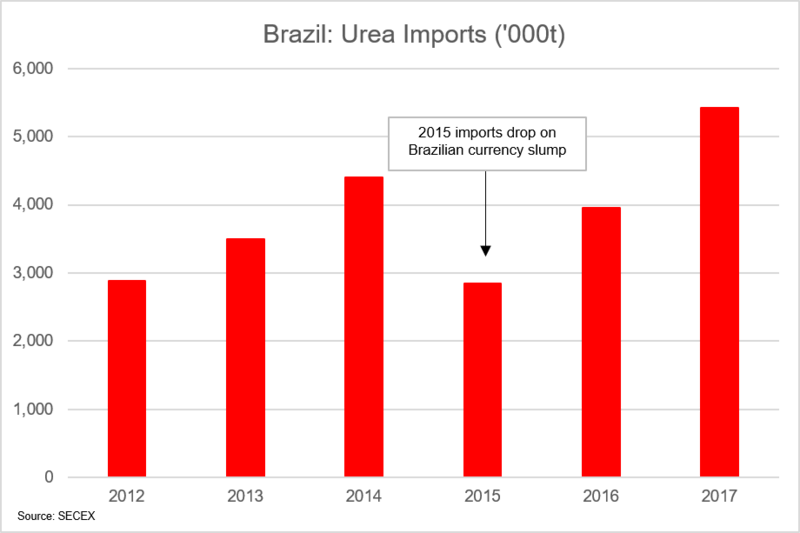 Similarly, Algeria and Egypt exported between 2-3 times more urea to Brazil year on year in 2017. In 2015, neither country had any presence in the Brazilian markets. The above exporters are set to battle it out for the extra 900,000t/year of available market share following the Petrobras shutdowns.